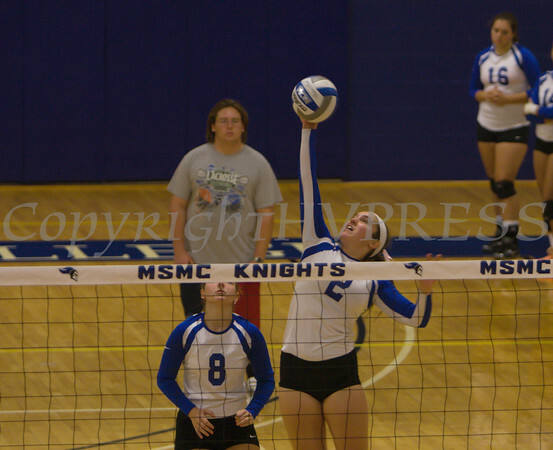 The Mount Saint Mary College women's volleyball team (9-14) fell to the William Paterson Pioneers (14-2), (25-23, 12-25, 25-21, 21-25, 12-15) in non-conference action at the Kaplan Center on Saturday, October 4, 2014. Mount Saint Mary Sophomore outside hitter Rachel Sabatini (2) had one of the best matches of her career against Brooklyn, leading the Knights with 16 kills and a .448 hitting percentage in three sets as the Mount sweeps the Brooklny Bulldogs at the Kaplan Center on Saturday, October 4, 2014. Hudson Valley Press/CHUCK STEWART, JR.